The Magisterial House of our Sovereign Order and State is proud of informing that, Femeraid International has a new Unit in the Kingdom of Belgium. 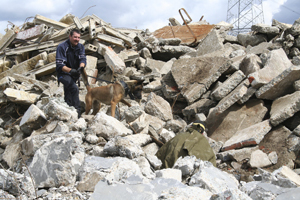 This new Unit, named FEMERAID INTERNATIONAL - BELGIUM, is a Cynotechnic Unit composed by 9 (nine) teams of Dogs and respective Trainers specially trained for Search and Rescue of Victims in case of catastrophe. All trainers are former military, special forces and firefighters specialized in dog training for this purpose, and they all integrate a non-for-profit institution named Belgium Rescue Dogs. The Femeraid Belgium is also ready to provide training of dogs and handlers in several countries in the World, and to work in conjunction with the other Femeraid International Teams. Mr. Krisztian Zerkowitz, Postulant to Knighthood, has been appointed ad Director of this new team. The action and commitment of H.G. the Lieutenant General and Prime Minister of the Government of our State was decisive for this important achievement.